Daytona Beach and Destin are all about sun, sand and fun. These world-famous vacation destinations have something for everyone, including great fishing, unbeatable golf, fun water activities and endless shopping. When people begin looking for accommodation, a quick internet search is how they usually start. As you scroll through the options, however, you'll realize that many of your choices are unrelated to what you had in mind. This is why you should work with Vacatia. 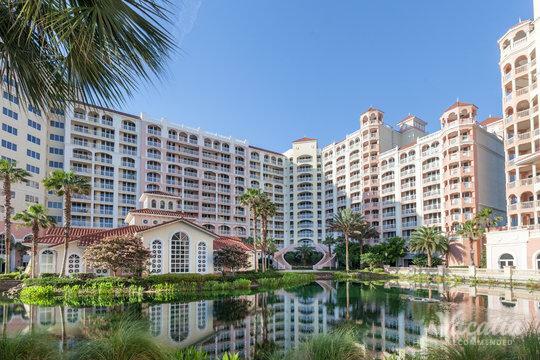 Our extensive and detailed listings are comprehensively organized so that you can find three-bedroom condo rentals in Destin quickly and easily. If you have any questions, our Guest Care team is always available via online chat. All of our three-bedroom vacation rentals in Destin have been highly recommended. When you book with Vacatia, you'll have the peace of mind of knowing exactly what to expect before you leave home. People, who are looking to spend their next getaway in a three-bedroom condo rental, are likely looking forward to enjoying home comforts while on vacation. With Vacatia's resort residences, you get the comforts of home and more. You'll get your own spacious living area where you can hang out with friends and family at your leisure. You'll also have a fully equipped kitchen in which you can prepare breakfast, lunch and dinner to save on food costs. Often, you'll also have an in-unit washer/dryer, so you can do a quick load of laundry to keep things light and fresh. In addition to these comforts, you'll get the services and amenities of a high-end resort. Daily housekeeping, concierge check-in, fun pools and waterslides, scheduled activities, delicious on-site dining and more will all be at your disposal. When you book with Vacatia, you get the best of both worlds. Once you've unpacked and rested up from your trip in one of Vacatia's highly recommended condo rentals, you will be all set to discover the fun and excitement of Destin and Daytona Beach. This area is perhaps best known for its turquoise waters and soft white sands. The shore is perfect for fishing, swimming, wading or just soaking up the sun. The teeming and ever-hungry underwater population ensures that you'll always have a lucky day of fishing. You can also enjoy a wide range of shopping and dining options. The Northwest Florida Airport has recently opened, allowing you to reach Daytona Beach and Destin more quickly and easily than ever. A short trip westward will bring you to the waterpark at Big Kahuna, where you can enjoy a thrilling afternoon of waterslides, waterfalls and pools. Southward, Henderson Beach State Park boasts beautiful nature trails that wind their way through dunes, pines and oaks.